Only fair that we clear this out of the way before we get to the Snowtroopers. Not to even mention Leia and the Fleet Troopers which are due out on Thursday. Oh my. There is some discussion as to if the AT-ST is worthwhile. It is a pricey proposition to bring to the fight, as you can see, coming in at 195 points. Only Vader is more expensive to put on the battlefield, and before Veers showed up you HAD to take him. 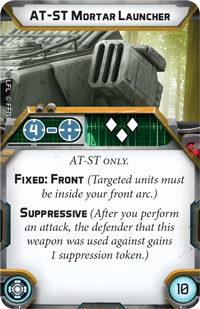 You can take up to two AT-STs as you can bring 0-2 Heavy units, but that's pretty much the extent of your points if that's something you want to do. After the required Commander and 3 Corps units, you're going to be pretty upgrade light if you go that path. That being said, what makes the AT-ST good is that it is very difficult to kill. 11 health to eliminate it, and 8 to damage it, means that it can be effective even in the face of some heavy fire. It is a Ground Vehicle after all, and so it is immune to suppression, though Ions can be either an annoyance or shut it down completely. It has Armor, which improves it's chances against light small arms fire, and defensive surges on white dice give it a 33% chance to avoid anything that does score a critical. Sure your opponent gets Impact 1 when firing at your Weakpoint 1: Rear, but that means they have to get behind you. 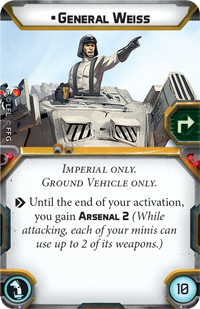 If you come from Armada, you already know how to use this guy - it's like any good Imperial vehicle: FRONT TOWARDS ENEMY. Also to be noted, it is HUGE on the table, so good luck getting it any sort of cover. Speaking of HUGE, it is able to see over pretty much any obstacle, so if your opponent isn't in base contact with those barricades, you're going to mulch their troopers. To help with the mulching it has a main gun of 2 Red / 2 Black / 2 White, with Range 1-4 and Impact 3. And you also get Arsenal 2 so you can equip one of the Hardpoint upgrades and shoot multiple weapons at once! Good for spreading suppression, or just focusing down one annoying target. Unfortunately no offensive surges, so that main gun is looking at 3 average hits. If you get into melee range with the thing, it can stomp its opponents with 4 Red dice Fence Cutting Blades. Also 3 damage average, but with a much lower ceiling. It's a different weapon than your main gun, and you are a vehicle and not a trooper, so if you're in stompin' range and the enemies are in your front arc, you can not only stomp but shoot the same target thanks to Arsenal 2 and not being engaged. You may look at the AT-ST and discount its mobility, being Speed 2, the same on paper speed as your typical trooper. Well, Speed 2's aren't all the same. 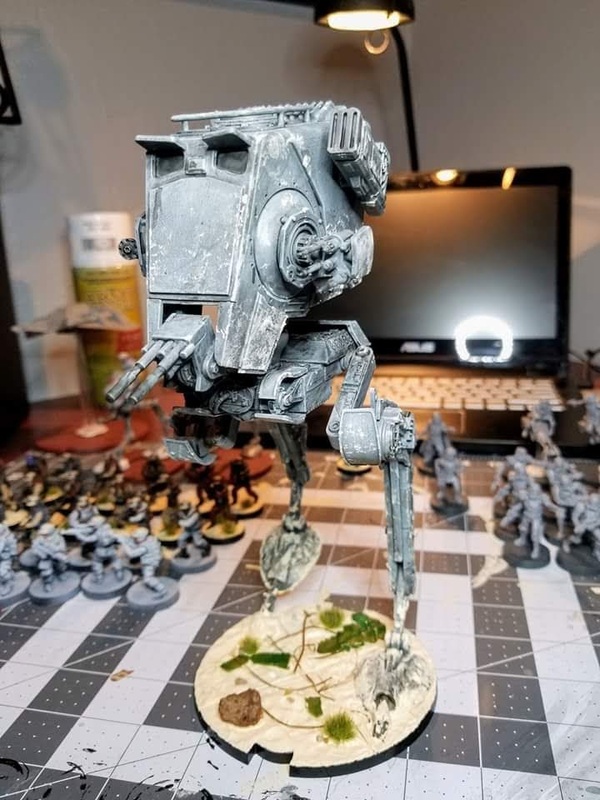 The AT-ST is on the biggest base you can have, which means you are actually moving much faster than a comparable trooper unit, actually closer to a Speeder Bike's speed in a single move. This means the AT-ST can close the distance quickly. And really, you should be moving with this beast and not just staying put if at all possible. As far as upgrades go, you're looking at 1 Pilot, up to 3 Hardpoints, and 1 Comm. This is the right pic, right? 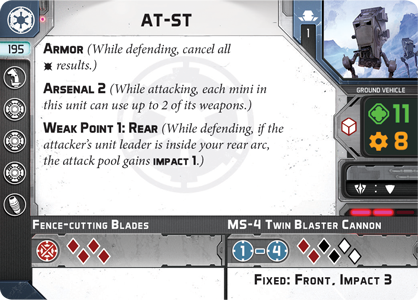 Weiss exists in Star Wars only in FFG Lore, but that doesn't mean he's a slouch. After all, the Raider Corvette eventually got some love. He's able to go on any Ground Vehicle, so keep an eye out for any expansion with a ground vehicle and a Pilot slot. 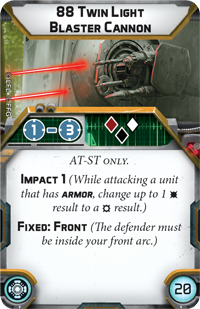 Weiss is a free action exhaust effect that gives your AT-ST Arsenal 2. This stacks with the existing Arsenal 2, to give Arsenal 4. Yes, this means 4 weapons at once. Don't worry, there's options to make that happen. You'll have to try really hard to get 3 weapons pointed at the same target, but it can be done. (Twin Blasters, Twin Light Blasters, Grenade Launcher), and you can get a 2nd attack in with whatever your 4th is against a differeny target. 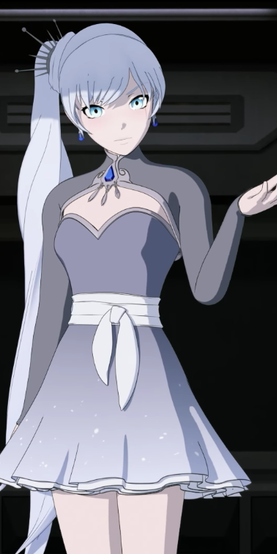 More likely you'll be using Weiss to shoot multiple targets, putting suppression down on something, and actually hurting something else. Weiss is best buddies with fellow General Veers, who's 3 Pip command can refresh his card for yet another go of it. It's basically the main gun for the AT-ST, but 1/2 the dice, 1/3 the Impact, and 3/4 the range. Still, if you've ever wanted to roll 9 dice at something at Range 3, and have it average 4.5 damage, it's a solid upgrade. It's a bit pricey for the upgrade that adds no keywords to the attack besides Impact 1. 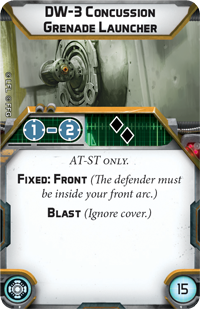 Still, you've got a pretty good chance of Acing an AT-RT using it and your main guns, not to mention being able to put some significant damage onto any Airspeeder dumb enough to sit in your front arc. If you're not running Weiss, maybe this one gets left behind for being too expensive. Or included for being the most utilitarian of the Hardpoint choices. If you hit something with this thing, you're really lucky. You've only got a .75 average damage with it, and an abysmal 58% chance to even score a single hit. Like all the other guns, it is Fixed: Front. That being said, Suppressive kicks in whether you hit someone or not. 1 Suppression token. If you do hit someone, they get a token as well. So that's a 58% chance of putting 2 tokens down on someone at long, long range. That's really hilarious if you can hit something out of Commander range and panic them off the map in Turn 1. Unlikely, but hilarious. It is something your opponent will have to game plan for, and forcing bad decisions is always a good thing. And it's cheap! Include to give yourself a long range board control option. Leave behind if you want to avoid the common trap of saying "Oh, I've got a Mortar Launcher, I'd better stay here in the backfield so I can keep using it." Don't just sit still with your AT-ST people! Locally, I don't think this guy has gotten the love that it should be getting. Also, I am not seeing great decision making with it. This is not a weapon that gets pointed at some 3rd or 4th target to spread around suppression. This is a weapon that gets added to the main gun attack to make it HURT. Range 1-2 and 2 Black dice aren't great by any means. Blast though. Blast is great. Blast tacked on to 11 dice pointed at a Trooper squad behind heavy cover trying to hold a specific objective (Twins, Light Twins, Concussion Grenade, Weiss) is 5.5 average damage with no cover. Add an Aim token, and you're pretty much popping a full health trooper squad. Did I mention you want to be moving with this guy, and not hanging back? There's no reason to have this guy holding down a flank. He should be in the middle of your troopers, punching a hole, which means in command range. 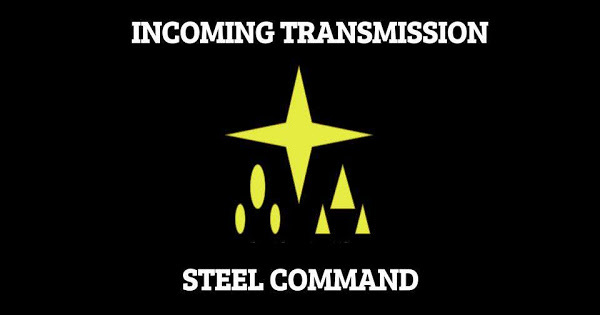 Leave the Long Range Comms at home. This is a slightly more difficult decision. It's a lot of points, but you're going to be pushing hard with this unit, so why not cause more chaos as you go? Keep those Airspeeders and Speederbikes honest. Keep Luke from tossing evades onto nearby troopers with his 2 Pip. Tell those Ion Snowtroopers that no, you're pretty sure you don't want them to get a free Weiss reload, and get all your actions. That being said, it is another 15 points you're tossing onto something you've already invested a lot of your list into. "I want every gun to fire on that man." Open up from long range with the Mortars and main gun, then close and start unloading everything while your supporting infantry take the objective. If you take fire, great, it means your infantry isn't. Back him up with Veers to hand Aim tokens and refresh Weiss for a second round of super shootin'. Just run forward, and start making cover not count. Saves you 25 points, and causes chaos for anyone you close with. So that's something. You're going to just sit back at Range 4 and lob mortars and your main gun at things. 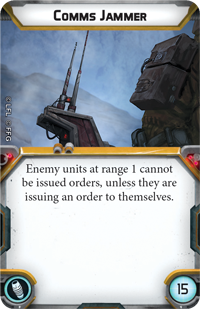 Why did you spend 205 points on this when you could have just taken 2 DLT Stormtroopers and gotten the same effect? Heck, you'll probably get the same effect with two Scout Trooper Heavy Weapons Teams and the sniper Heavy Weapon upgrade. Don't fall into this trap. Move forward! I've not been great about telling you how to paint Imperials, so I'm going to turn it over to Jake, the first one of us to finish a pretty good AT-ST. He based it like his Scarif Map. I started trying to follow along with Sorastro's YouTube video on painting the AT-ST. I quickly realized in my inexperience I want going to be able to gradually build up the highlights from Mechanicus Standard Grey and Zandri Dust to the lighter Celestra Grey at the highest points. I simply didn't understand the concept fully and noticed that the lighter colors weren't blending. So I decided to base everything like he does on the video, and the roughly dry brush the whole model in 2-3 layers gradually lighter layers, starting with a mix of Mechanicus Standard Grey, a little Zandri Dustz and some Celestra Grey, adding more Celestra Grey, with each layer. It worked well enough on the detailed parts, such as the legs, and gave the flat surfaces of the head a slightly scratched and weathered metal look. From there I continued to follow the video, using Nuln Oil and Typhus Corrosion pretty liberally. Since I was basing the model in AK Interactive Beach Sand, I peppered some sand all over the model, mostly in the legs and gave it very heavily weathered, Scarif-used feel (or at least tried to). We're going to be doing more in depth painting guides with some of the other Pittsburgh guys in the future, so keep an eye for more stuff from Jake (if he wants to) and Chris (the guy who did the really good Vader and Speeder Bikes) Going to hit the Snowtroopers next so we can get to Leia and Fleet Troopers because I am super excited to get more Rebels to paint!